Thomas has been with us for a number of years now. As a council member, he believes that the value of being on the board has increased enormously over time given how tailored the chamber can be to one’s preferences. For more information on the Council nominations process and timeline, please follow this link. If you’re interested but want to know more about being a Council member, or standing for President, contact Glenn for an informal discussion. Nomination forms must be filled in and sent to glenn@britishchamber.be by 24 April 2015. My relationship with the chamber started around six or seven years ago when I was invited to an event. The moment I was seated at the event, I knew that this was a place I needed to be. 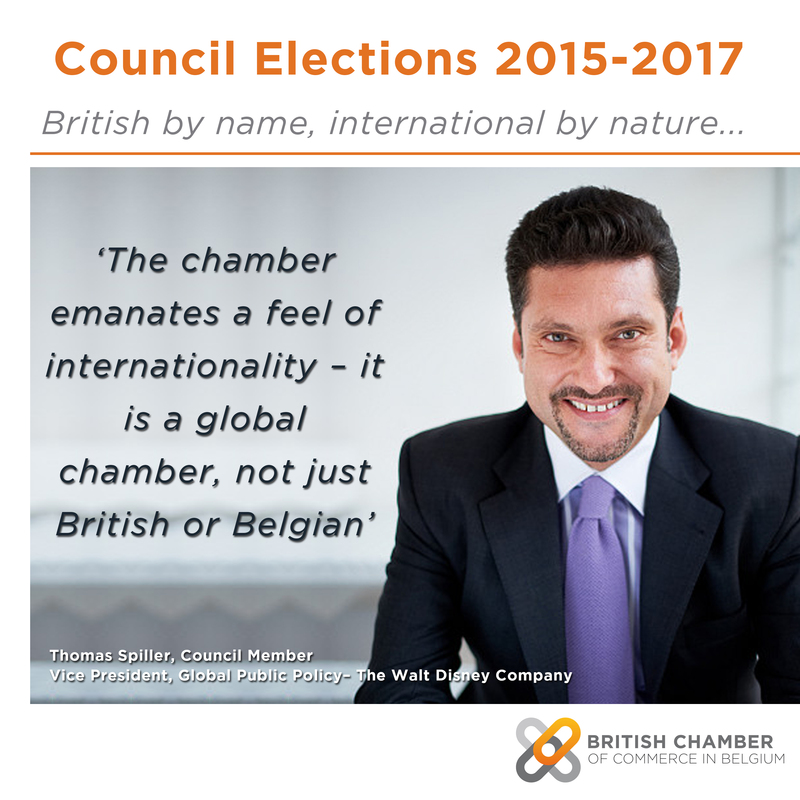 The chamber emanates a feel of internationality – it is a global chamber, not just British or Belgian. The flexibility of the chamber was also plus. There is not just one strand of interest; the events are à la carte in a sense. There is always something that will interest someone, somewhere. Over the past few years, I believe that the chamber has become better structured, more professional and has clearer goals and missions. One of these missions has been to have better communication with members and the outside world, and to really improve the chamber’s brand. Having a clear focus has allowed the chamber to mature and professionalise over the time I have been here and the value of being a member has improved significantly. The British Chamber has an important standing in Brussels. Britain is one of, if not, the most pro-business countries in Europe. This allows the chamber to offer businesses in Europe the advice and the platform to launch or expand their operations. The resources that the chamber has are far and wide and this is a very unique offering. From an EU public policy side, that is also key as member companies come accompanied with the pro-business halo that Britain brings. Having a chamber which is more diverse and reflective of the world in which we live is something the chamber should strive towards – not just in terms of gender, but in terms of nationality too. If you look at global business trends, there is a heavier influence from the East European countries, and also from Asia of course. This is similar to EU affairs where the standing of East European, Nordic and Baltic countries has gotten bigger. It would be impressive if the British Chamber of Commerce in Belgium was able to reflect this in their event programme as well as its Council. The Brussels New Generation is important for the chamber too because it offers the younger generations a place to network and to grow and to bring their own sets of values, ideas and plans. Here they can be trained and be part of an organisation that is steered towards helping people and businesses grow and flourish.